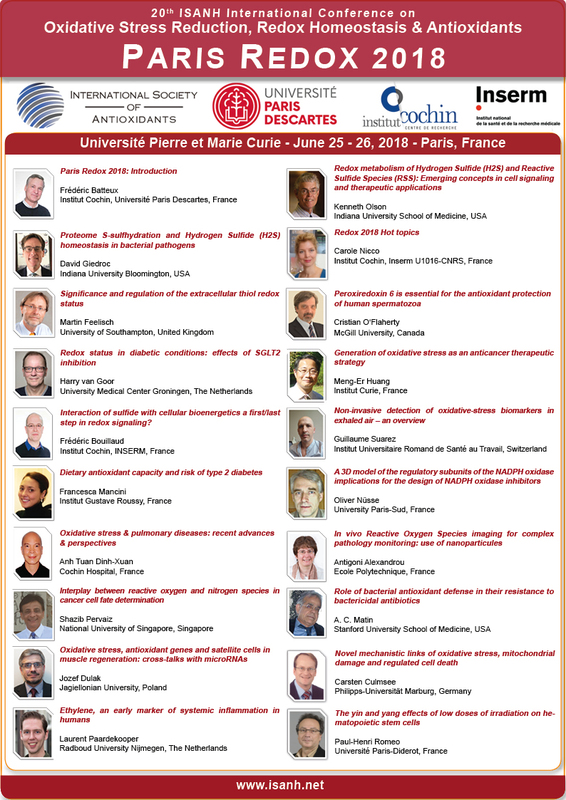 During Paris Redox 2018, Dr Meng-Er Huang from Institut Curie, Paris, France will give a strategic presentation about the Generation of oxidative stress as an anticancer therapeutic strategy. One of the significant features of cancer cells, when compared the normal ones, is a persistent pro-oxidative state. Therefore, cancer cells are generally more vulnerable to further oxidative insults than their normal counterparts, which constitutes the biological basis of redox modulation-based anticancer strategy. Dr Huang's recent studies using comparative proteomic analyses of cancer cell lines lead to identify several pathways that potentially condition intrinsic cellular sensitivity/resistance to a set of redox-modulating drugs. Rationally targeting these pathways should selectively kill cancer cells or overcome drug resistance. Detail and updated results will be presented during the Paris Redox 2018.